CHICAGO – Can DirecTV do what so many other companies have failed to do and actually rewrite the way shows make it to air? They did something truly remarkable with their deal to co-produce and co-air “Friday Night Lights” and now they have taken it a step further by exclusively airing the new season of “Damages,” starting tomorrow night, July 13th, 2011. With a slightly new tone allowed by longer running time and no censorship, “Damages” feels rebooted, a familiar courtroom with a few new rules. It seems clear now that “Damages” will never quite match the overall quality of its brilliant first season. The second and third seasons were good but they felt a bit more convoluted and forced than chapter one despite some strong performances. The writing in subsequent seasons never quite matched the first and I think that’s one of the reasons that “Damages” never completely clicked with a wide audience. The show was a huge critical hit, earning multiple Emmy nominations, but it never found strong ratings. At least not strong enough for FX. Now, weak for FX is impressive for a fledgling network, especially one with as horrendous a name as DirecTV’s Audience Network (which used to be “The 101”). In a brilliant move, someone at DirecTV decided that esteem is what they need now more than anything else. Get the name out there by taking a quality property like “Damages.” Why start from ground zero? What harm it could do to take a show with a built-in following, even if that audience may be relatively small? And if they could land an Emmy nod or two out of it? It could put the network on the map. One thing that hasn’t changed is the structure of “Damages,” which opens with a mysterious tragedy and then flashes back to detail how we got there. The premiere of the fourth season of “Damages” sets several plotlines and characters in motion but most are centered around the military industrial complex, personified by a Cheney-esque character played to slimy perfection by John Goodman, the main guest star for the new season, stepping into the shoes of notable guests like William Hurt, Ted Danson, and Martin Short (all three were nominated for an Emmy). Goodman plays the head of High Star, a company that has clearly been up to no good in Afghanistan. At the beginning of the season, they’re up for renewal by the U.S. government while Ellen (Rose Byrne) is beginning an investigation into their practices. To do so, she has contacted an old friend (Chris Messina), who happens to be the only survivor of a mission that went very wrong. Dylan Baker also co-stars as the man who cleans up after particularly sinister messes are made. What about Patty Hewes? In the premiere, it’s relatively unclear how she’ll play into the overall arc of the season, other than the fact that Ellen, somewhat surprisingly, still goes to the woman who tried to kill her for advice. 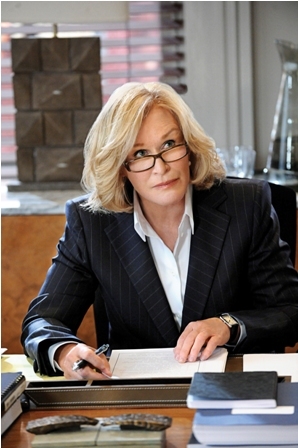 The season premiere of “Damages” focuses heavily on Patty’s personal life. She is taking care of her granddaughter after the drama with her son from last season (this one picks up three years later, so the child can be a toddler) and trying to balance her career with the child’s care. Last season featured an emphasis on a financial crisis that felt inspired by the Bernie Madoff ordeal and this year feels similarly ripped from the headlines as controversy around our involvement in the Middle East continues to play a role in daily headlines. What’s interesting about this arc is that it’s still unclear the specific role that Goodman’s character will play. The actor was perfectly cast, bringing a mix of menace and mirth to the role that not a lot of other actors could have pulled off. This is one of those guys who may honestly believe that the corners he cuts and the lives he puts in jeopardy are worth it for the greater good. 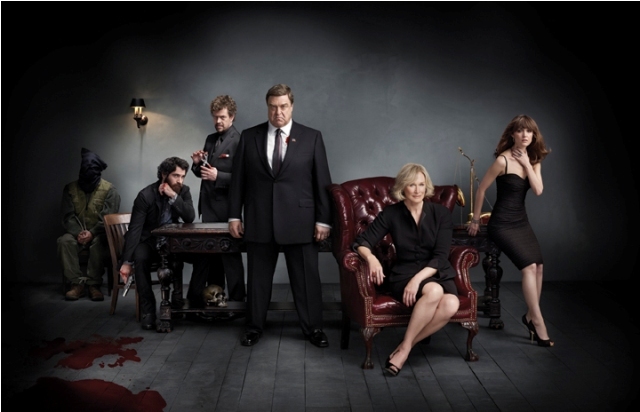 One of the main reasons I’m excited for season four of “Damages” is the potential shown by John Goodman in the first episode. He’s stellar from minute one and a likely Emmy nominee next year. Of course, Byrne and Close have been invited to the Emmy party before and they haven’t lost a step. They know these characters so well by now that the only concern is that they might be somewhat complacent in the parts. What other shades of Patty Hewes could Close have to show us? Only time will tell (and she plays a surprisingly small role in the premiere), but I never doubt actresses this talented. She’ll find something new this season. And I expect Byrne will as well. It’s likely that both actresses and the writers of the show will be reinvigorated by the freedom allowed by the Audience Network. No commercials means a longer running time, which equates to a pace that feels less manic than “Damages” sometimes did on FX. The premiere is a slow burn more than the fires we’ve seen in the past and I think that’s a product of both the new home and the running time. The writers are giving scenes more room to breathe, making a show that feels more like AMC or HBO than FX. Where will “Damages” go from here? Will critics and the Academy still recognize it on another network? I hope so. The premiere of season four certainly doesn’t represent a drop in quality from the last two, so why shouldn’t we pay it as much attention? Just because it’s in a new home. Nonsense. Of course, I know a lot of you don’t have DirecTV. Find a friend who does. Until then, check out last season, recently released on DVD only (boo) from Sony. The third season of “Damages” was a strong 4/5, another installment that earned multiple Emmy nominations (and should have earned at least one more for the woefully-underrated Tate Donovan). Special features on the complete third season box set from Sony include a commentary on Episode 3.7 by Martin Short, Glenn Kessler, Todd A. Kessler, & Daniel Zelman, commentary on episode 3.13 by Rose Byrne, Tate Donovan, both Kesslers, & Zelman, deleted scenes, “Directing ‘Damages’,” episode introductions, “Damages Season 3 — A Look Back,” “Sometimes You Just Get Damaged Blooper Reel,” and season three teaser. “Damages” stars Glenn Close, Rose Byrne, Dylan Baker, Chris Messina, and John Goodman. The fourth season premieres on The Audience Network on DirecTV on Wednesday, July 13th, 2011 at 9pm CST.